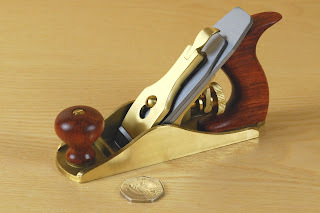 The Stanley Bailey No.1 smoothing plane was produced from 1869 to 1943 when it was dropped from the range, presumably because of the squeeze on resources brought about by WW2. They were never produced in large numbers so their comparative rarity makes them a favourite with collectors and they now command astonishing sums at auction. Like the Stanley original, the Quangsheng No.1 has a 1-1/5" wide iron, a bailey pattern frog and no lateral adjuster. Sales volumes of these planes have naturally been lower than those for the full size bench planes and production of them ceased about a year ago. I was able to get a single one made as a special gift to thank a friend - possibly the only time a factory in China has produced one of anything! They are perfectly suited for children and much easier for them to use than a block plane. Imagine how fast you would go off woodworking if you had to do all your planing with a 60-1/2 that is the size of a shoe box! America is now a very much more wealthy nation than it was in the late 1800's and the American people are naturally interested in collecting the tools that their forbear's made. If I had a time machine and could go back to an 19th century tool shop I'd clean them out of mint boxed Stanley No.1's in a heartbeat! Now take a punt on where China is going to be in 100 years time. If the original was in production for 74 years it must have been bought and used by someone, mint examples are thin on the ground, so the people who owned them must have used them. Although they are no longer in regular production, we have managed to get a small batch of Quangsheng No.1's made. Whether this will happen again in the future is anyone's guess. I have absolutely no need for one, but this is soooooo tempting. I've been meaning to try out a Quangsheng for a while, but have (had) most bases covered. Now there's absolutely no reason not to. Let me know when they're in. Iechyd da indeed! I rushed to open the box on returning from the works do last night (12.30ish) Firts impressions - Wow, they're beautiful! I'm going to have two very proud little boys on the 25th! Can't wait! I just hope that Dad gets to play with their new toyls! I have a Lie Nielsen No 1 for my children to use, and I actually think it is a bit on the small side even for children. I bought it about a year ago, and my youngest son who was 7 at that time was unable to wrap his hand around the rear tote. I think that a No 2 would be better suited, but I haven't tried one. That aside it is a cute little plane.